Whenever we hear that our current situation has to hold us back from our future aspirations we are reminded of the fact that we will achieve whatever we believe we can achieve. Thank you to an awesome staff and amazing student body for proving that nothing can hold us back when we hold each other accountable to high expectations. 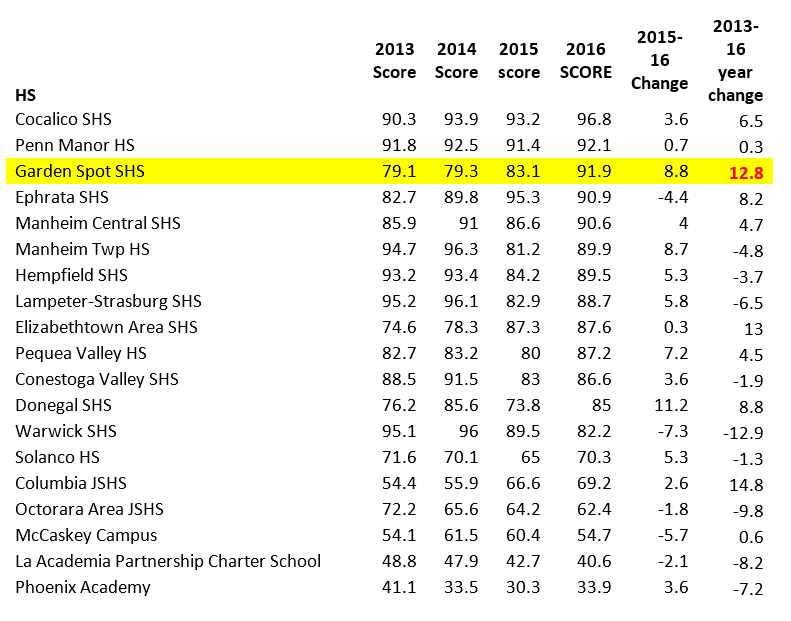 What a great sign of continued growth… 3rd in the county among all high schools. 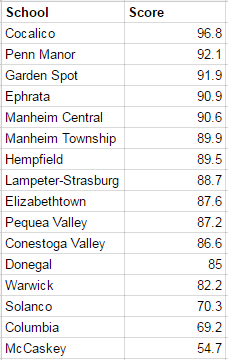 4th in the state among high schools with greater than 40% economically disadvantaged student population. Your success matters to us, and we will relentlessly pursue every student that enters our building. Very honored to have the privilege of working with such amazing students, staff, and community. Thank you for your continued support! For a detailed look at the many factors included in attaining the School Performance Profile score, check out Garden Spot High School’s Profile. Data is not all we do, but our continued growth is certainly an excellent sign of health. It’s a great day to be a Spartan! To this day, I remember my dad dragging me through the halls of Annville-Cleona High School on a Saturday morning well before an afternoon football game. My principal, who just happened to be my neighbor, was more than happy to oblige my dad’s request. You see, I received a poor grade on a Spanish II quiz the previous week that had the potential of rendering me ineligible to play the next week. As fate would have it, I had a Spanish II unit test coming up the next week and I failed to take home my book and notes to study over the weekend. My dad would have none of it. While I was embarrassed at the time, I look back on that moment fondly. I am thankful that my dad cared enough to hold me accountable, and I’m glad I had a principal that promoted the “student” in student-athlete. Trust me, there are plenty of opportunities for parents to get involved with their child’s education at Garden Spot High School that are far less embarrassing. One such opportunity is coming up on Thursday, September 22nd. On behalf of the faculty, staff, and administration, I would like to invite you to Parent’s Night! Festivities begin at 6:45 PM in the Stan Dean Auditorium. During this event you will have the opportunity to follow your child’s schedule and speak with members of our faculty. The event concludes at 8:00 PM and light refreshments will be provided throughout the evening. We hope to see you on Thursday, September 22, 2016 at 6:45 PM for Parent’s Night! This week Garden Spot High School celebrates the accomplishments of the Spartan Rifle team that recently won the Lancaster-Lebanon League Championship! Congratulations! Led by “Marksman of the Year”, Julia Irvin, the Spartans posted their best record in over 30 years with 11 wins and 1 loss. You can read all about the team’s exciting finish to the season at Lancaster Online. As I followed the team’s success throughout the course of the year, I was reminded of how fortunate I was to play on several championship teams throughout my high school and college athletic career. While those accolades do not make me anything special, those experiences certainly taught me something special about the team concept and the importance of accountability. These experiences have made me a better principal, colleague, husband, and father. One of the most memorable athletic experiences I had was in college while playing a small role on a pretty impressive “team”. You can read about my experience by clicking here. Ultimately, our expectation of excellence as a member of that “team” has followed us in our career paths. Daron (the holder) is now President and CEO of Rosie Pope Maternity, and he has frequented such TV shows as Bravo’s Pregnant in Heels. Brett (the kicker) is now a Tournament Director for the PGA, and he was recently named the Tournament Director of the 2016 Ryder Cup. As for me (the long snapper), I am fortunate enough, as principal, to lead a group of students and staff to similar successes in life as my teammates and I enjoyed as a result of our experience in college. Only time will tell of the importance this championship has had on the members of our Rifle team, and I cannot wait to read about it! Again, congratulations to the Spartan Rifle team! It’s a great day to be a Spartan! By now I’m sure many of you have read the LancasterOnline article regarding a local teacher who recently resigned from her teaching position of 20 years. What you may not know is that Gina de Vitry is a dear friend of mine, and I admire her courage to do what she felt was best. Let’s be honest, how many of us would leave the comfort of a profession we have held for 20 years because we did not like the direction it was going? Her resignation appropriately sheds light on a bigger issue within the realm of public education – standardized testing. While I believe standardized testing (i.e. PSSA and Keystone Exams) has its place in education, it should not be the sole indicator of success and effectiveness. Unfortunately, standardized testing is now the driving force behind public education and it is how schools are now being judged. Kudos to those who have the courage to do what they feel is best! Good luck, Gina! Course Selection – Coming Soon! It’s that time of year again when we prepare our students and their families for the course selection process. Course selection is an exciting time for all students and best exemplifies the partnership between family and school. As we transition into the course selection process, we ask that you and your child identify future academic and career goals so courses can be chosen that will lead to successful attainment of those goals. The future success of your child relies heavily upon the courses they take in high school. Moreover, your child’s education is not only important to our local economy, but to our national economy. Research shows time and time again a direct correlation between an individual’s level of education and the future success of that individual and his or her country. That is why we take course selection so seriously at Garden Spot High School. Much time and energy is invested by the high school guidance counselors and administrative team in helping students make informed decisions. Discussions regarding course selection begin in October and the entire process is not complete until mid-summer. From an administrative perspective, the scheduling process is extremely important as we utilize student course request data to assign staff, allocate resources, and decide which courses will and will not be offered. Ultimately, students are responsible for the courses they request. Course requests should only be completed after carefully consulting with parents, teachers, and counselors. School counselors are available throughout the process to answer any questions regarding course selection. Furthermore, students are permitted to submit schedule change requests during the selection and verification stages of scheduling from February to the last day of the current school year. After this time, no changes will be accepted. Please note, 2015/16 Course Selection will occur online as it has been done in the past. Directions for 2015/16 Course Selection as well as the 2015/16 Course Selection Guide are available on the High School’s website. We look forward to working with you and your child as they take steps toward preparing for a successful and productive future. We encourage our students to challenge themselves academically by setting realistic goals and enrolling in courses that will best meet their future needs. Please contact your child’s school counselor with any questions you have regarding course selection. It sure is a great day to be a Spartan, and here is to a successful February! On behalf of the entire faculty and staff of Garden Spot Senior High School, it is my pleasure to invite you to our Parent/Teacher Program for the second semester to be held on Tuesday, February 10, 2015 from 6:45 PM to 8:00 PM. The snow date for the second semester program will be Tuesday, February 17, 2015 at 6:45 PM. We would also like to invite you to our 2015/16 Course Selection presentation that occurs the same evening at 6:00 PM in the High School Auditorium, just before our Parent/Teacher Program. This informational meeting will allow you to gain a thorough understanding of the course selection process at Garden Spot High School as your child prepares for the upcoming school year. This program provides you the opportunity to meet the high school administration and follow your child’s schedule as you meet each of his/her teachers. This is an excellent opportunity to gain a better understanding of your child’s academic schedule and the requirements of their courses. It is also a tremendous opportunity to meet the staff at Garden Spot High School. You will be able to get a “snapshot” of each class and information about major projects and assignments. We encourage you to speak with your son/daughter and complete the enclosed schedule for the evening. As you are completing the schedule, please include the room number of each class. If your child has a class that meets every other day, feel free to visit either one. Student guides will be available to assist you in finding your child’s classes. Please remember, time will not permit conferences with individual teachers during the program. However, school counselors will be available around the Guidance suite to schedule conferences with teachers or the counselors for a later date. Please mark these dates on your calendar. Again, I encourage you to take advantage of this unique opportunity.